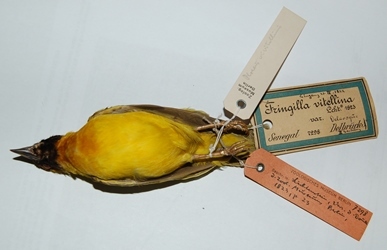 The Vitelline Masked Weaver was formally described by Martin Lichtenstein, a German physician and explorer, who was appointed as director of the Berlin Zoological Museum from 1813. 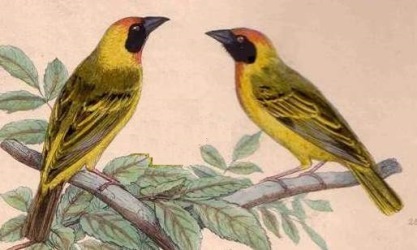 Lichtenstein wrote a brief description in Latin for the Vitelline Masked Weaver, and noted its origin as Senegambia. He did not mention the collector, but two type specimens are in the Berlin Museum of Natural History, and the labels list Delbruck, a German collector. Lichtenstein listed 3 specimens, but one was sold to (or exchanged with) the museum in Vienna (Pelzeln 1887). Although Lichtenstein often sold or exchanged duplicate specimens before adequately describing them, he made the Berlin Museum one of the most active ornithological research centres in Europe. 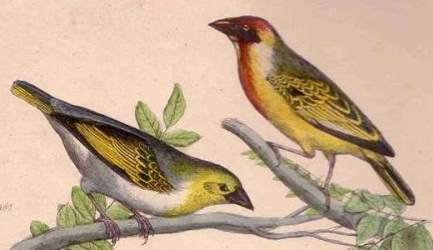 The first illustration of a Vitelline Masked Weaver is a colour painting by Muller 1854 (but I do not have a copy of this). The next illustration is a set of birds painted in colour by Reichenbach (1863). Fringilla vitellina	Lichtenstein 1823 Verz. Doubl., p.23	Senegambia. vitellinus Med. Latin: vitellinus, a deep yellow colour tinged red (Latin: vitellus, egg-yolk). Rufous crowned Weaver (Swainson 1837), referring to the orange tinge on the crown. Black-faced Weaver, Kenya Vitelline Masked Weaver, Rufous crowned Weaver. Two syntypes are in the Berlin Museum and one in the Vienna Museum.